The Mars Rover Curiosity’s activity was temporarily stopped due to an electrical anomaly that happened on February 27, 2015. During the transfer of dust samples just taken from a drill using the robotic arm, the fault protection system was triggered. The telemetry data sent by Curiosity indicated that there was a short circuit and for this reason its activity was stopped. It’s not the first time that the Mars Rover Curiosity suffers from electrical faults. It happened on the day of its landing on Mars and again in November 2013. In those cases, it was what is called “soft short”, which is a short circuit that occurs when current passes through some material that is only partially an electricity conductor. In this case, the Mars Rover Curiosity had been working for a few days in an area near the base of Mount Sharp where a rock called Telegraph Peak was found. 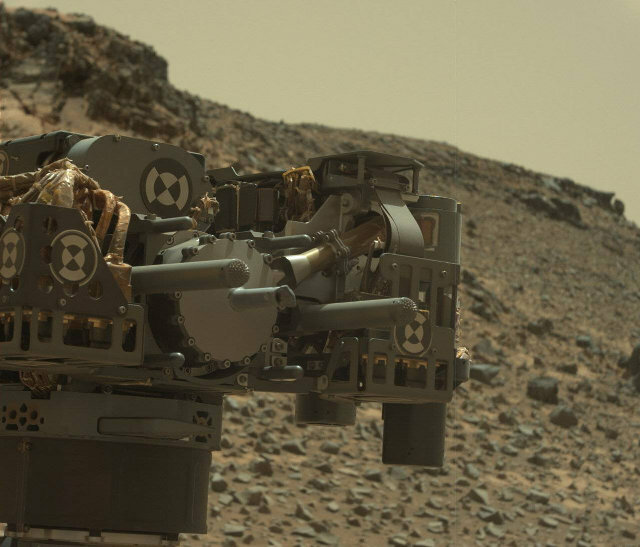 It had just completed a drilling operation into the rock and was using its robotic arm to transfer some dust samples inside it to be analyzed by its instruments. Those operations were already carried out with no problems by the Mars Rover Curiosity during its explorations on the red planet. This time something didn’t work and there was a transient short circuit with a consequent stop of its activities. The Jet Propulsion Laboratory of NASA began testing Curiosity’s systems to find the causes of the problem and neither the robotic arm nor the rover will be moved before finding answers. The electrical systems of the Mars Rover Curiosity were built to tolerate with no problems voltage variations in order to prevent them from being damaged. However, those abnormalities can make them more sensitive to further short circuits and indicate serious problems in some components of Curiosity. Given the obvious impossibility to repair any hardware faults that may hit the Mars Rover Curiosity, any problem is dealt with very carefully. Delaying operations a couple of weeks in a mission that will hopefully continue for several years isn’t a big deal. Putting the mission in jeopardy because of a problem not addressed properly would be very serious.